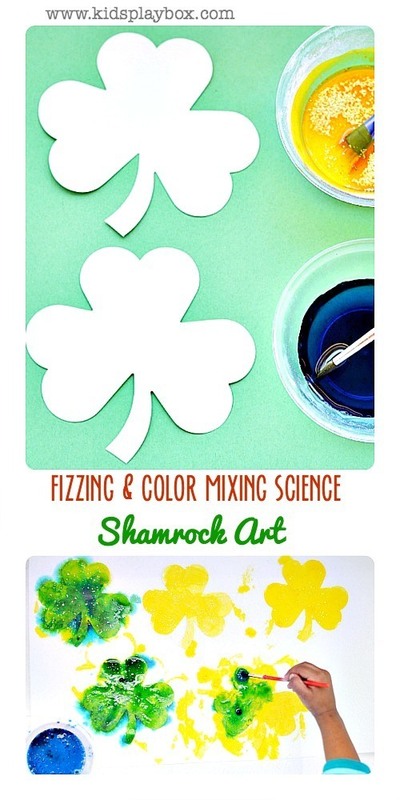 Color mixing science and acid-base reactions are used in creating this beautiful St.Patrick’s Day Art. Shamrock art project couldn’t get easier. Yellow Paint : 2 TBSP of baking soda mixed with 3 TBSP of water and a squirt of yellow food color with a generous pinch of gold glitter. 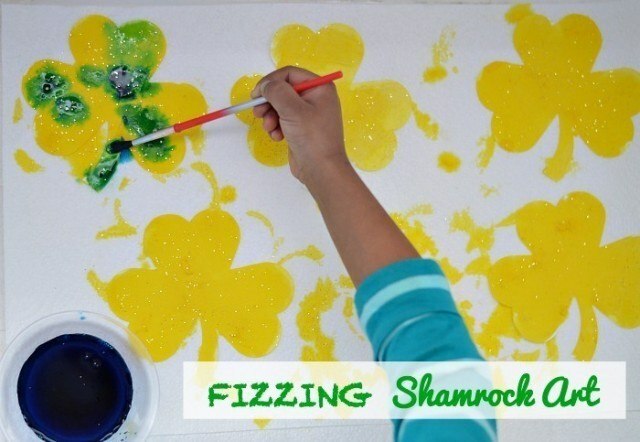 Surprise your child by inviting him/her to paint the shamrocks yellow! Then comes the baking soda-vinegar reaction! 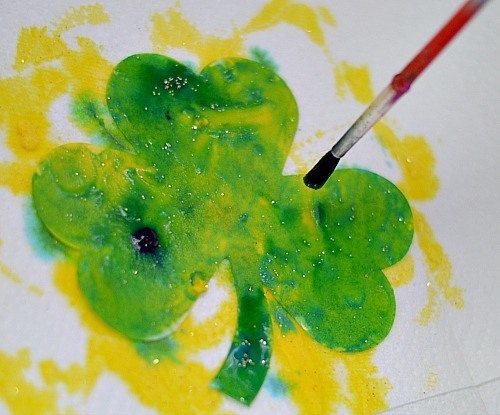 Yes, this shamrock art project has a small dose of science in it. 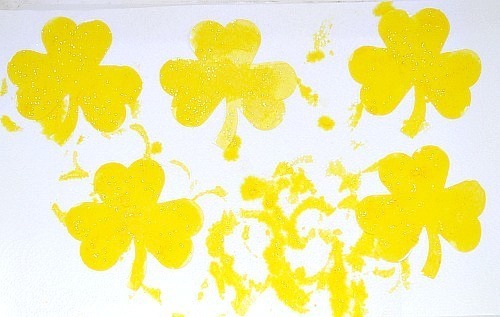 Have the child dip her brush in the blue paint and gently press it on the yellow shamrocks. Have him observe the 2 changes that are happening. 2. While the color is changing they also hear the “fizzing” sound of the baking soda – vinegar reaction. 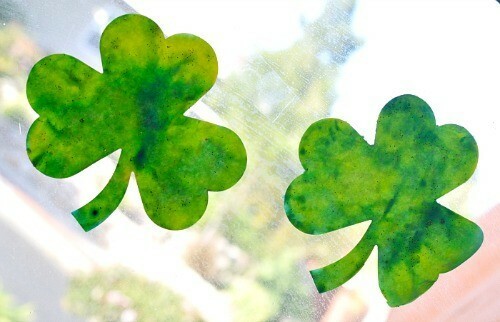 Let the shamrocks dry for a while and then hold them up against a sunny window. 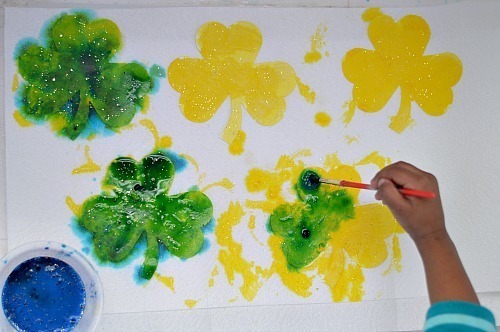 This St.Patrick’s Day art project is simply an exploring, open-ended art project. What happens is that the baking soda forms a white layer over the art. Use a pastry brush to gently brush off the excess baking soda. As it dries you may see the blue and the yellow in various spots. 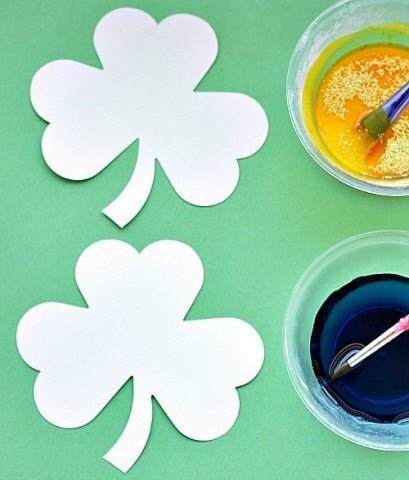 Follow Kids Play Box’s board St Patrick’s Day on Pinterest.